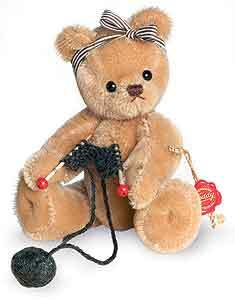 Teddy Hermann Teddy Girl Bear with knitting. She is fully jointed and made of the finest blond Mohair. She has safety eyes, synthetic filling material, non growler, Mohair is surface washable only. Size 16cm. An ideal gift for the Knitter in your life!